Some of my better shots of these unique, relatively under-appreciated feathered denizens of permant water habitats (except of course to avid birders and wildlife enthusiasts). Almost all of these photos were taken on Lake Osakis, a large shallow lake at Osakis, Minnesota in the central part of the state. This lake harbors 6 species of grebes, plus other waterbirds including a variety of ducks, geese, pelicans, coots, etc. 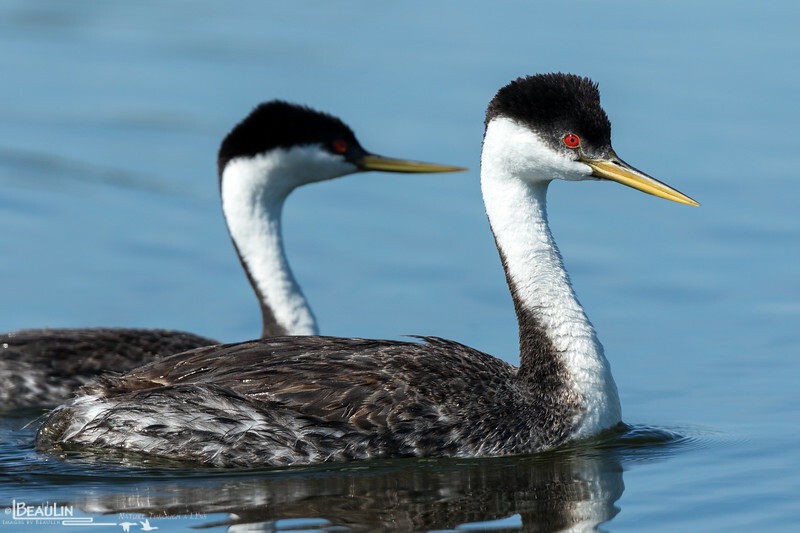 Western grebes are by far the most numerous on Lake Osakis, which is the eastern-most lake in North America that hosts such high densities of the species. During some years, reproduction of westerns is quite good and up to half of breeding pairs hatch 3 to 4 chicks. Fortunately, this species has become quite used to boats and fisherman, thus providing excellent opportunities for aspiring wildlife photographers. Subordinate pair of western grebes (Aechmophorus occidentalis) waiting for nest sites to become availalbe at a nesting colony on a central Minnesota lake near Osakis.